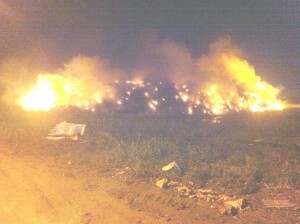 Even as fire fighters were making significant progress in extinguishing a three-week old blaze at the Haags-Bosch Landfill, a heated exchange arose Monday at City Hall about why Public Health Officers were not included in a meeting with Minister of Communities Ronald Bulkan about the garbage disposal facility. Fire Chief, Marlon Gentle told Demerara Waves Online News that about 70 percent of the fire has been extinguished. Saying that the fire is similar to a volcano in which the burning is taking place underground, Gentle said extinguishing the blaze and preventing a recurrence was no quick-fix. He recommended that authorities abide by the design and methodologies for the Haags-Bosch Landfill. Those strategies, he said, should include sorting of waste, filling, back-filling, covering with pure soil, gas-venting and compacting. “This is no quick fix because the gases keep coming up and we are trying to isolate the fires,” he said. “All you have to do is keep unearthing and finding where it is burning, it is almost like a volcanic kind of situation. You have to go down find it starve it and cover it down,” he added. The Fire Chief appealed to authorities to abide strictly by the recommended method of operation of the Haags-Bosch Landfill. “We have to get the dos and don’t’s right. We have to understand that we have to take responsibility for our actions,” he said. Over at City Hall, there was a fiery debate at the Statutory Meeting over the absence of members of the Public Health Department at the meeting with Bulkan. King was reporting on the meeting with the minister during the Council’s fortnightly statutory meeting. This prompted Councillor Ian Andrews to question if any public health officers of the council were included in the discussion. King responded that although a team from the Ministry of Health was present, the Council’s public health officers were not there. This sparked outrage from other Councillor Devi Ross who stood up to voice her disapproval that these officers were not invited. “They are isolating the public health department,” she shouted. She opined that this represents the number one department of the Council, especially in view of the many health issues affecting citizens. Deputy Mayor Patricia Chase-Green responded that she was confused as to why councillors were questioning the issue when they were the same ones who initially said that a large delegation was not necessary to attend the meeting. Chase-Green argued that the Council worked assiduously under the former administration to prevent an outbreak of any kind although no money was granted the municipality. Meanwhile, King informed that a major challenge had to do with litter-pickers who have been blocking the road daily, thus preventing garbage disposal trucks from accessing Haags Bosch Landfill. The National Police have since been called in and this situation is somewhat under control. Following the meeting, the Deputy Mayor told this publication that the government recently gave the City Council $100M to close off completely the old dump site in Le Repentir Cemetery and to assist with works at Haags-Bosch. A new cell has since been opened.